It is time for another Trendy Twine Tuesday!!! I apologize for posting so late in the day today but this week is crazyyyy for me with school so I'm running behind in just about everything. Today I just have a super simple idea for you: Outlining things with twine! For my project I used the new Lettering Delights Food Fun Pop Up Cards! This set was just so adorable I had to give it a try. 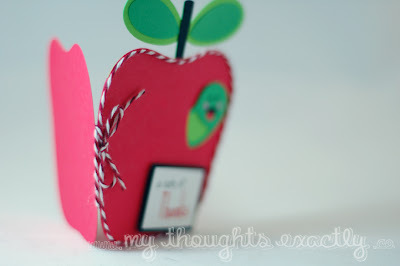 When I saw the cute apple card I thought it would be perfect for a teacher thank you card and of course perfect for this month's highlighted twine color: Peppermint Stick! So here is my project! I put a small line of glue around the border of the card and carefully placed my twine all the way around the edge. I finished it off by wrapping some twine around the fold of the card and tying a bow right over the area where my twine border began and ended to hide the overlap. On the front I stamped "A note of Thanks". 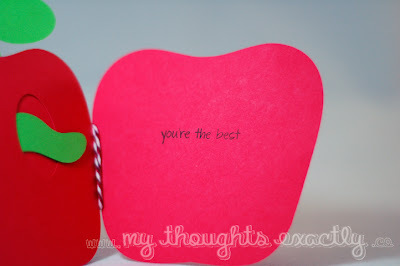 On the inside I stamped "You're the best"
I know this is a super simple idea but I hope you all have enjoyed it nonetheless! 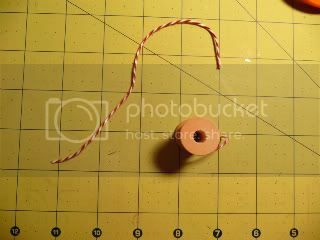 Hi everyone, Bee here for my Trendy Twine Tuesday... and this time I made a little tin for my sweet friend Bee and used Trendy Twine in place of ribbon to cover the sides of the tin. The paper is from the Country Drive collection by Echo Park. I used Peppermint Stick Trendy Twine for the lid, and Chocolate Truffle Trendy Twine for the bottom. I love the sort of "rustic" look, and I think it feels wonderful also when you hold the tin in your hand. Let's have some fun. Want to get 30 yds of the new twine that just came out? Go to the Trendy Twine facebook page, look for the picture of pink and blue Cotton Candy twine, and leave a comment on that post. You have until midnight central standard time, Saturday the 17th, to enter. Three winners will be announced on Sunday. Good luck =D. Are you ready for a Twine Tutorial? 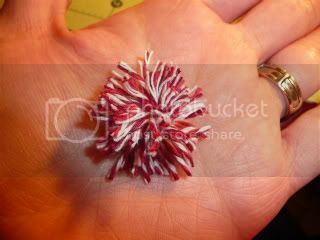 Today, I thought I would share how to make cute twine pom-poms for your projects. These are really cute and super easy! Cut a piece of twine about 5 in. or so and keep it close. 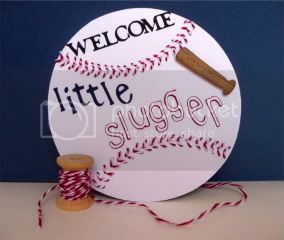 This will be used to tie the middle of the Pom-Pom. 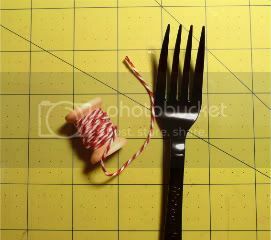 Take the Fork and the Twine, wrap Twine around the fork 25-30 times. This is what it will look like. 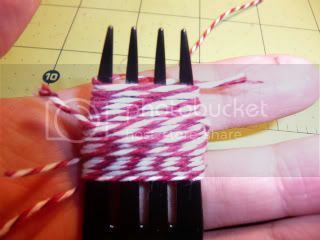 Then take the piece of twine you cut and place it in the middle of the fork tines and tie it into a knot around the Twine. 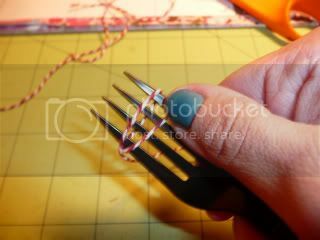 After the Twine is tied securely, slide it off the fork. 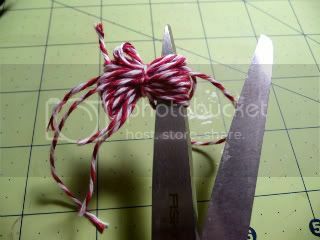 Take your scissors and cut the two "loops" on each side. Fluff your pom-pom until it the way you prefer it! 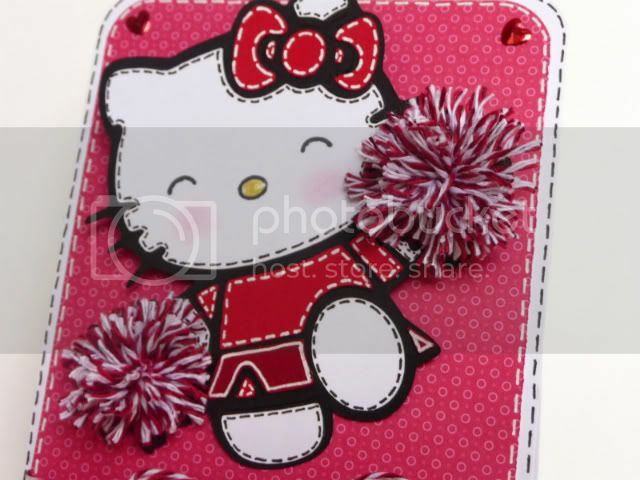 Here is my card with the finished Twine Pom-Poms. 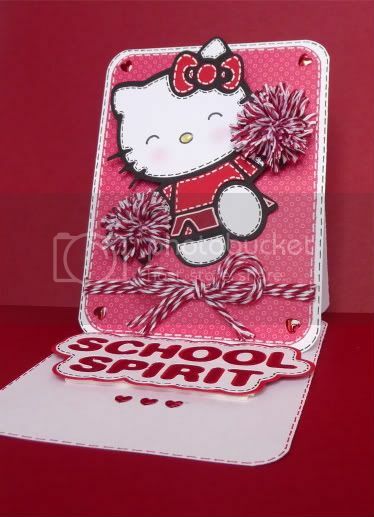 Close-up of the cute Hello Kitty Cheerleader!! Details of this card on my Blog. I hope you enjoyed this Twine Tutorial! 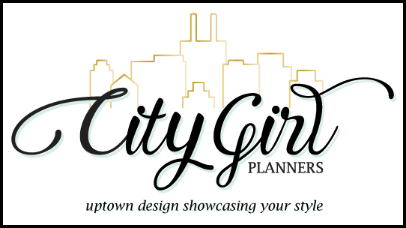 I can't wait for you to try it out and see all the super fun projects you can come up with! Don't forget about the Trendy Twine Challenge!! Also, Alyssa still has a giveaway on her blog, HERE! After patiently waiting.... well, ok, just waiting... the new colors have finally arrived and are in the store. WOOO HOOO!!! So exciting. There is Posy (a soft pink with natural twine), Sky (light blue with natural twine), and Cotton Candy (light pink and light blue). The natural twine gives Posy and Sky a very soft look, almost a bit of a vintage flair. Cotton Candy is so fun with the two cheery colors. ﻿And the other color that is finally here... just in time for Autumn and Thanksgiving is Orange Truffle. 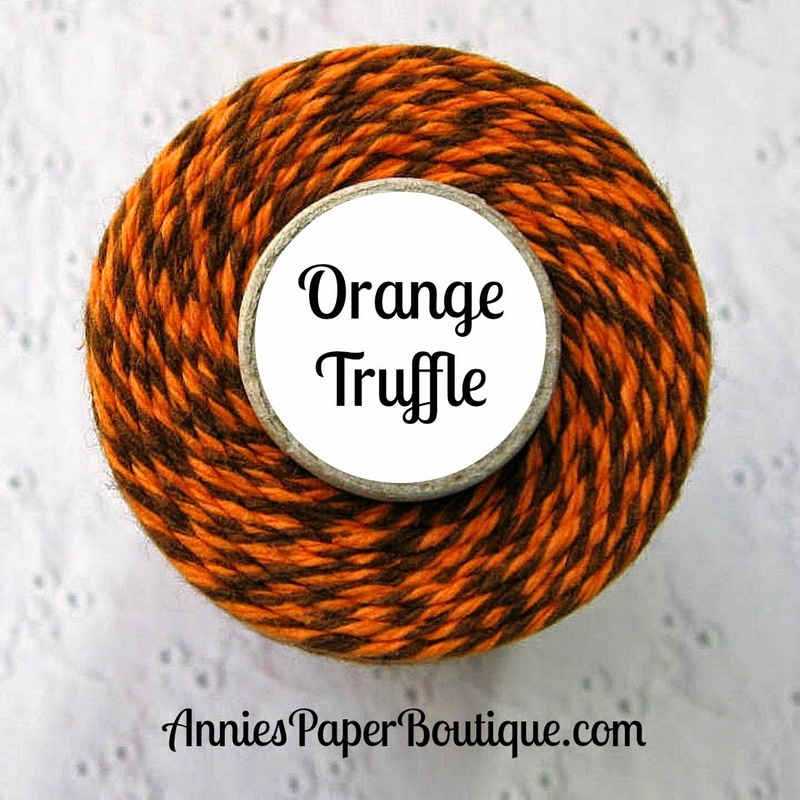 This festive twine is a nice orange and yummy brown. Isn't it delish? Tomorrow is Tuesday and you know what that means.... It's time for another fabulously fantastic post from the DT. 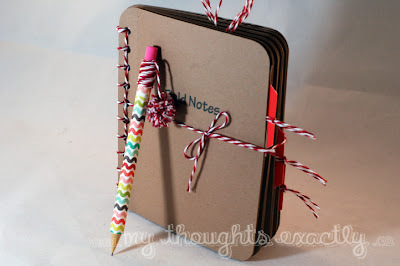 And don't forget to join the challenge for a chance to win some Trendy Twine. Today is the very first Trendy Twine Design Team Tuesday!! 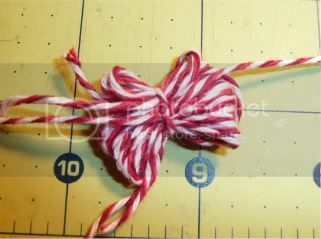 This month the Design Team is featuring the Peppermint Stick- Red, Burgundy and White Twine. We are also featuring our very first Challenge!! "Show us your favorite use for twine." This Challenge will run from Sept. 6th -29th (midnight). One *random* prize for 30 yards of Peppermint Stick. Link your project on the bottom of this post! Now for some Design Team Inspiration! !